Do you have red, blue or purple veins that are popping up on your body? Spider veins are not cause for medical concern, but can be cosmetically frustrating and often noticeable at a young age. For some, these veins might not appear until later in life. We have a safe, effective and mostly painless process for removing veins. At Fountain of Youth, we use laser therapy to remove spider veins. The laser system will deliver light energy through pulses which will allow the blood within your veins to redirect deep below your skin’s surface, to their original point. Most patients see results in just six weeks after a few rounds of treatment. You are free to resume your normal activities immediately, with exception to difficult exercise that will result in sweating. Over shaving your legs, underarms or bikini area again and again? Us too! Laser Hair Removal is a great technique that can save you time throughout the year after an initial commitment to the procedure. It’s actually one of the most commonly completed cosmetic procedures in the U.S. – to complete, we beam highly concentrated light into your hair follicles – then, the pigment in your hair follicles can absorb the light. This process destroys the hair so it won’t grow back. If you’re considering treatment, we’d love to schedule you for a consult. You will need to avoid shaving, plucking or waxing, as well as sun exposure for up to six weeks before we begin our treatment. Chemical Peels are a great way to get rid of unwanted surface dark spots and create bright, glowing complexions – which are often hiding under those first layers of skin. Our experts will work with you to see which chemical peel is right for your face. Most often clients will request a chemical peel to help with acne scarring, sun spots or unwanted ‘bland’ complexions. Dermaplaning, which is also called microplaning or blading, can be added to your facial procedure. This process further removes the outermost dead skin cells and exfoliates the surface layers of your skin using a very small blade. Starting to see deep lines appear on your face? Don’t panic – Fountain of Youth is to the rescue with our Juvederm injections. This procedure using hyaluronic acid dermal fillers which provide up to one year of correction for facial wrinkles and deep lines, also known as folds, that you may be seeing. Often we treat nasolabial folds, which are the lines from the nose to the corners of the mouth. We’ll have you smiling with a full face in no time. Are you starting to see lines around your face? Unwanted lines can be an unwelcome part of the aging process – we’re here to help. Botox injections are a quick process that can keep you looking young and healthy for years to come. Botox cosmetic targets the common wrinkle areas such as frown lines and crow’s feet that take place from using the same muscles, such as frowning and squinting throughout the past years. Our specialist will inject these muscles with Botox to temporarily reduce muscle activity which will create a visible smoothing of the lines you’re seeing. 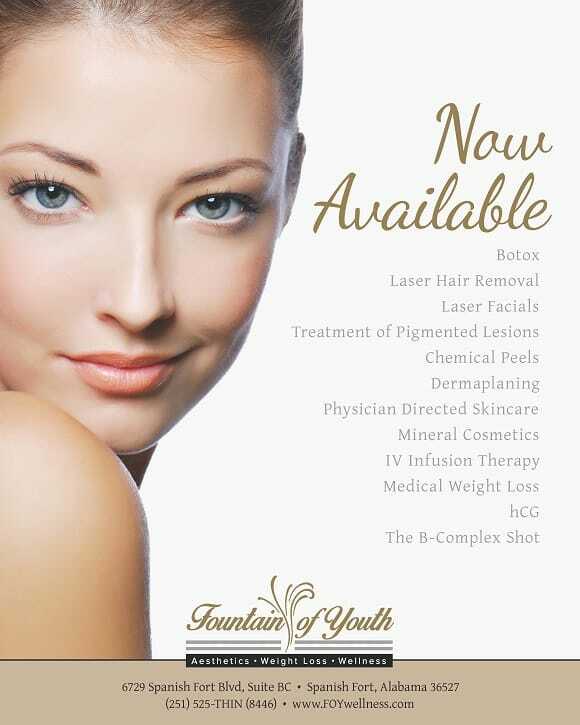 Whether you choose Botox, or Juvederm – we have you covered for all your wrinkle reduction needs at Fountain of Youth. By keeping a regular facial schedule, including our chemical peels, and dermaplaning, we can help you avoid further wrinkle accumulation in the future. Our team is here to assist you with all of your cosmetic goals to help you be your best version of yourself, keeping a youthful glow throughout all of your years. Fountain of Youth is the only provider on the Eastern Shore with jane iredale mineral makeup. This high-performance multitasking mineral makeup is perfect for sensitive skin. If you’re looking for a cruelty-free full coverage makeup that hides fine lines and wrinkles then make an appointment with Fountain of Youth today! Permanent makeup is a cosmetic technique which employs tattoos (permanent pigmentation of the dermis) as a means of producing designs that resemble makeup, such as eyelining and other permanent enhancing colors to the skin of the face, lips, and eyelids. Fountain of Youth can do; Eyebrows, Lips, Eyeliner, and even tattoo Areolas. The high-frequency facial is a skin care treatment used by professionals to help treat and prevent stubborn acne, shrink enlarged pores, reduce the appearance of fine lines and wrinkles, decongest puffy eyes, fade dark eye circles, rejuvenate the condition of the scalp and nourish hair follicles for healthier hair growth.